I have been with this company for just over a year now, and everything I have experienced from them speaks to them being a company that is ethical, generous and really determined to make a difference in the world. I remember reading last year something about the head of Norwex in Australia having a goal to have every Australian have an envirocloth in their house – that’s the “everything cloth” that you use JUST WITH WATER to clean just about any surface – cupboards, walls, carpet, car seats, bathrooms, basins, kitchen sink. Imagine how much less chemicals would be absorbed into our bodies, draining down our sinks into our rivers and flowing through the food chain, if that could happen. Well, it can. I have been teaching people how to clean without chemicals, online and off, for sometime now, and it is a job I LOVE. Norwex has now introduced a range of products designed to help reduce single use plastics as well, and that is where my focus is going to be this month. I am not starting a “Plastic-free-March” but I am going to be focussed on reducing disposable plastics as my theme this month. But I digress. Why can the dream of every family owning at least one envirocloth be achieved so easily? 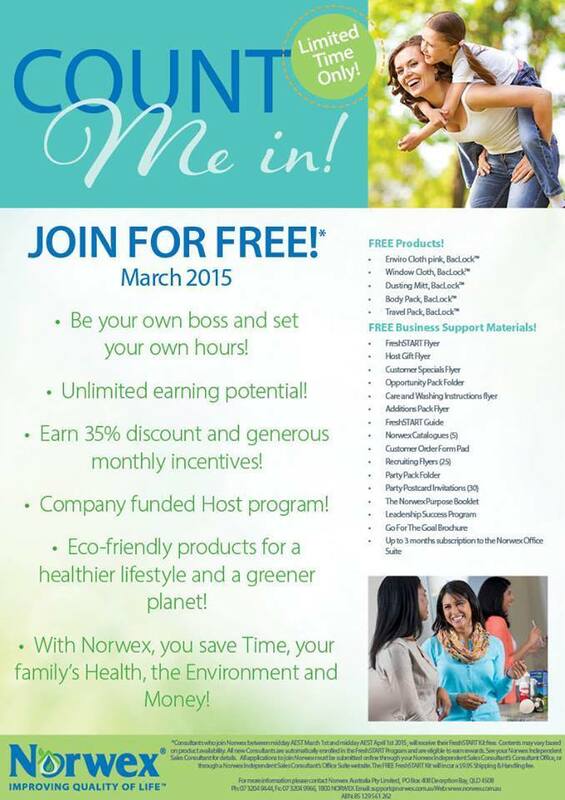 Because Norwex is offering people the option to join for free this month! There is a $9.95 shipping charge, but for that you get the envirocloth, window cloth, dusting mitt and several other cloths. So, I’m going to tell you more about this amazing opportunity tomorrow, which you can take whether you want to build a business or simply become a “smart shopper”, but in the meantime, just think about whether you, or someone you know, would find this beneficial? Feel free to get in touch with me before then, if you have questions, or you can just sign up right now, right here. Otherwise, look out for my post tomorrow with more info! ← Why are the Norwex Body Cloths so Effective Against Acne?